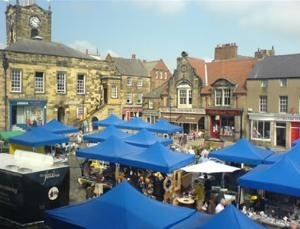 Running concurrently with the Food Festival is the Alnwick Beer Festival. Organised by the Alnwick and District Round Table the Festival has been running for quite a few years now and is increasing in popularity. It includes over 30 real ales, ciders, wine and soft drinks. Tickets work on a voucher system, with each half pint of beer usually costing one voucher. Vouchers can be bought in multiples of four and are limited in number, so booking in advance is advised. Visit their website for more information. Every year in early August Alnwick welcomes musicians from all over the world to join in it's annual International Music Festival. For eight days the town centre is lit up by folk music, dancing and costume, with the centre of the Festival's events being in the Marketplace. This is an exciting, colourful and lively event that the whole town gets involved in, with other events taking place at various venues. See their website for more information about who will be performing this year. Alnwick's spectacular Fireworks Display is organised each year by the Alnwick and District Round Table and somehow they manage to make each one more impressive than the last. It is held at Alnwick Rugby Club (Willowburn Avenue) on the outskirts of the South of town, close to the junction with the A1. It is usually held on the closest Saturday to November 5th, check out our Events page for this year's date. Each Shrove Tuesday there is a very interesting football match with a difference held in 'the pastures' in the shadow of Alnwick Castle. Known locally as 'Scoring the Hales' the match is between the local parishes of St Paul's and St Michaels. The ball is fetched from the Castle preceded by the Duke of Northumberland's Piper and the match is won by the team who first scores two goals. The event is popular with locals and it's free to come along and watch the match. A variety of other Events run regularly at the Alnwick Playhouse, Alnwick Castle and The Alnwick Garden. Their events are listed in our Events section and also on their own websites.